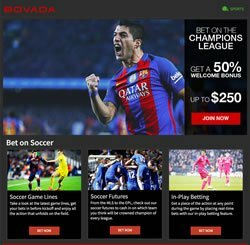 Bovada has been a prominent source for online gaming entertainment for over five years running and a preferred destination for USA soccer betting action. The site features a sportsbook, racebook and an online casino. Over 200 million bets have been placed with the site in their operational tenure, making them one of the most popular online gambling options for betting on soccer, playing blackjack or wagering on the Triple Crown. Bovada exclusively caters to bettors from the United States, providing them a safe and legal option to place bets. The company is well-known for their betting line options, security protocols and exceptional customer service. Bovada operates out of Mohawk Territory of Kahnawake, Canada, and has legal licensing from the Kahnawake Gaming Commission. They are also regulated by their presiding government. Since Bovada operates outside of the United States, it is unaffected by US gambling laws and is free to welcome customers from the United States. This section of our reviews is crucial because it demonstrates the legitimacy of each brand. You will find that we have purposely included it in every single one of our US Soccer Betting Site Reviews. Bovada offers its users bonuses and promotional offerings that you won’t find in Vegas sportsbooks. These bonuses act as “free money” that is added to your sportsbook bankroll. Upon making your first successful deposit, Bovada will grant you a 50% bonus up to $250 as part of their Welcome Bonus. Bovada also has a Refer-A-Friend bonus, where you will receive $40 of your friends’ first deposit, up to $100. It is not unusual to see seasonal bonuses that are tied to major sports events, such as the World Cup. There are other bonuses that are specific to the casino and racetrack parts of the site, as well as other seasonal promotions that are offered throughout the year. Bovada has two deposit options on their site—credit/debit card and Bitcoin. Bitcoin is the faster and more reliable method. Their payout methods are restricted to either Bitcoin or a check-by-courier. All financial options are 100% secure thanks to Bovada’s top-notch security profile. Any questions or concerns about finances can be addressed through the site’s FAQs or through their customer service. What Soccer Leagues Can I Bet On At Bovada? You can bet on leagues from all over the globe. The most popular domestic leagues are located in England, Italy, Germany, France, Spain and the United States. These leagues include the Premier League, Serie A, Bundisliga, Ligue 1, La Liga and Major League Soccer, respectively. What Types Of Soccer Betting Lines Does Bovada Offer? Bovada provides betting lines on prominent soccer leagues from around the world. This includes the Premier League, Major League Soccer, Serie A, Ligue 1, Bundisliga, La Liga and more. You can even bet on second and third division leagues from some countries. Bovada also has betting lines on international and regional tournaments. What Kind Of Wagering Options Are Available For Betting On Soccer At Bovada? There are several different types of wagering options offered on the site. The most common bets include betting on a team to win based on a predetermined point spread. You can also place a moneyline bet on a team to win outright with no dependency on a point spread. There are over/under bets on the amount of goals scored in the game. Bovada even has alternate betting lines and parlay bets, prop bets and future bets available. Wagering options will update as new fixtures come out. Does Bovada Offer Live Betting On Soccer? Yes. Bovada has live betting on soccer matches. During games, you can bet on different final score lines, which teams will score in the first and second halves, the total amount of goals scored and more. Live betting lines are time-sensitive, meaning some will expire as the game progresses. Live betting is an exciting way of engaging with game in real time and its fast-paced nature has fans actively participating in a meaningful way. Does Bovada Offer Mobile Betting On Soccer? Yes. Bovada has mobile betting services, so you can bet on soccer matches on the go. The mobile site also has the same security and betting line standards as the web version. These mobile versions are designed to be compatible with most devices, carriers and operating systems. The aim of the mobile version is to make it as easy as possible to engage with the site no matter where you are located from your smartphone or tablet. Does Bovada Offer Betting Lines On The World Cup? Yes. The World Cup happens every four years, and with it come exclusive World Cup betting lines and wagering options. The next World Cup is set to take place in 2018 in Russia. Does Bovada Offer Betting Lines On The Champions League? Yes. Bovada has betting lines on Champions League fixtures. There are also varied wagering types, including special bets on certain players to score, certain teams to advance, etc. Bovada’s reputation is one of professionalism, security and quality. The site has been successful since its launch and has provided a variety of betting lines and wagering options on sports from around the world. Their impeccable credentials, security standards, bonus program and live and mobile betting features give bettors the confidence to place the bets they want safely and legally. In regards to soccer, Bovada has a strong assortment of betting lines from global leagues and major tournaments including the World Cup, Euros and Champions League. With the number of leagues and fixtures, there is never a shortage of soccer betting lines for fans to get in on through the site. Soccer fans can further engage with the sport through betting with Bovada, as they’ll constantly update their available betting lines.